There was quite a reaction to the photos of Etoile that were posted on her first day at the ScPA, just three weeks ago. It is true, she looked absolutely terrified, and many people contacted the refuge and DRC to see what they could do to help her. Of course, what she needed, like most new arrivals, was a bit of time to realise that things were not so bad after all. A week or so later and the pictures told a different story. 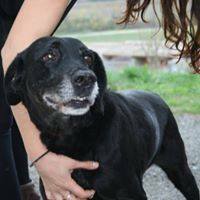 Etoile had found her feet, was sharing her kennel and enjoying her walks. Life wasn’t too bad after all. But what she didn’t realise was that it was about to get better still! Sandra, who had found Etoile and brought her to the refuge to see if her owners were looking for her, could not get Etoile off her mind. 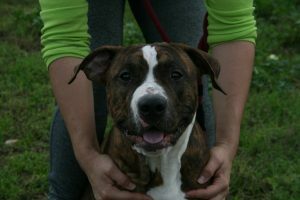 Let’s face it, many people who bring dogs to the ScPA forget about them immediately; even when they are their own dogs! Not Sandra, however. She resolved to offer a home to Etoile if she was not reclaimed, and this is all the more wonderful as Sandra lives in Germany. 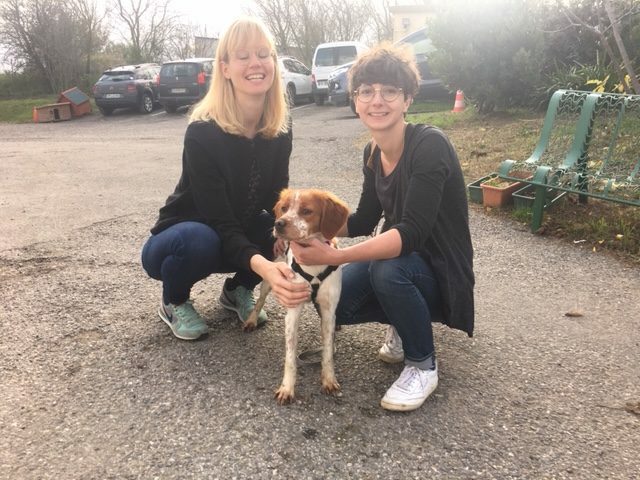 She was only on holiday in Carcassonne when Etoile came into her life and has just made the journey back to collect her new dog! 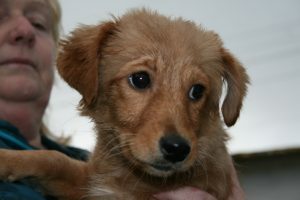 So Etoile, complete with rabies vaccination and passport, will soon be on her way to a new life in Germany! 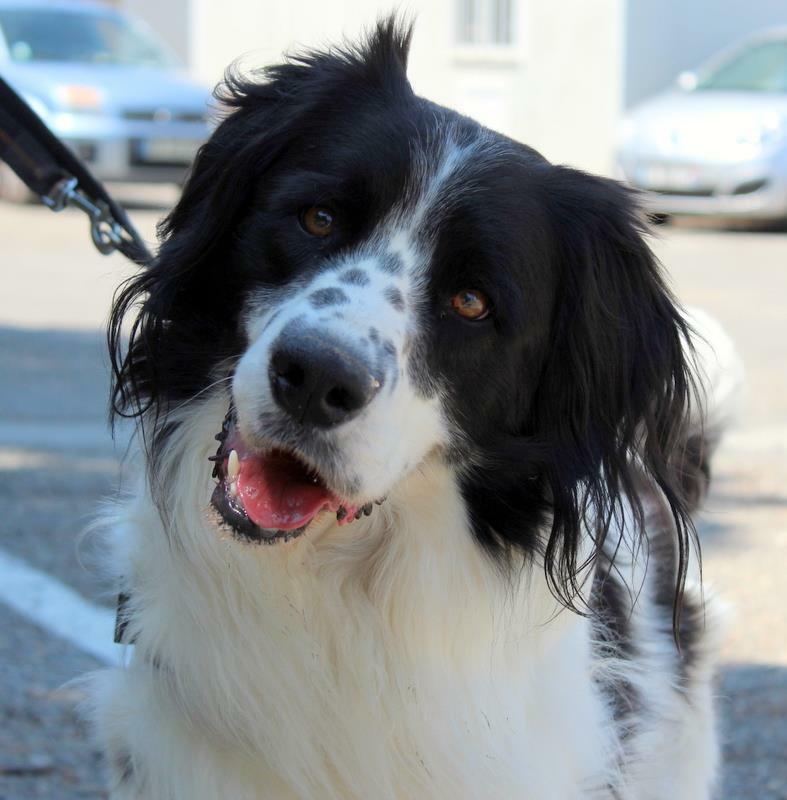 Etoile – ADOPTED and looking much happier. 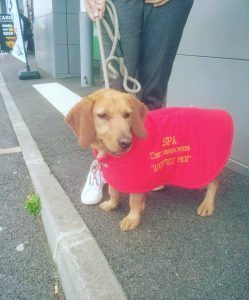 Stories like this make us all smile, so many thanks to Sandra and her friend for making such a long journey to collect this little dog who had stolen her heart. Good times ahead for Prosper. Today, at last, we said goodbye to Prosper. This lovely little boy has been looking for a new family for just short of 6 months. And considering his CV, that is quite a long time. Prosper is good with dogs of both sexes as well as cats and children. In fact so well behaved is he that he was chosen to represent the ScPA at the open day at MaxiZoo last month, where he behaved impeccably. Well yesterday he was spotted by what turned out to be his new family, who came back today to adopt him. So his dream of a new home has finally came true and we wish him all the love in the world. In his new life he will have at least one human by his side at all times, and will even be able to go to work with one of his family from time to time. We hope he will continue to behave impeccably. 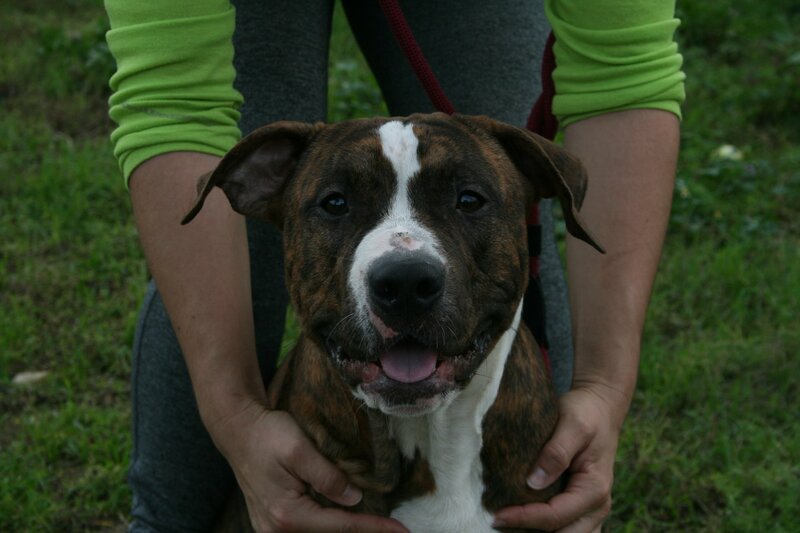 There were no adoptions yesterday, but O’Thor, a magnificent American Staffordshire was reclaimed by his owner. Great news as refuge life was not suiting him at all. He was brought in for rehoming by his owner who was having some personal difficulties and it is wonderful that things have been sorted out before her beloved dog was rehomed. And another dog was reclaimed today, too. Saturday’s late arrival, whom we called Mouse, but who in real life is called Zoe left this afternoon. Her family phoned the ScPA yesterday, but as their dog was not identified, they had to wait till the vets were open today to collect. Still, at least Zoe is now microchipped and back where she belongs, in a warm home. So not a bad start to the week. Let’s hope it is a bumper one for adoptions. We often get older doggies arriving at the refuge when their owner takes ill or moves into residential care but that was not the case with poor Jageur. Jageur was abandoned at 11 years of age and he is HATING refuge life. All this boy wants is his family back. In all my time at the SPA I have never seen such a visibly stressed dog. This is manifesting itself in incessant barking which is very hard to ignore. This cant be good for him, the dogs around him for anyone else who has to listen to it. Even on a walk he barks all the time and I have to say our walk on Tuesday was not pleasant. He has been on my mind ever since then and how we, in a refuge situation can make life better for him? I have an adaptil collar for him, maybe that will help a little and next week I will try and take him away from the refuge to the lake and see how he settles in a different location. Maybe its time he needs and will settle soon. How sad that a dog ends up in this stressed. heartbroken state at 11 years old. If you think you could foster or even adopt this lovely boy then please do get in touch. 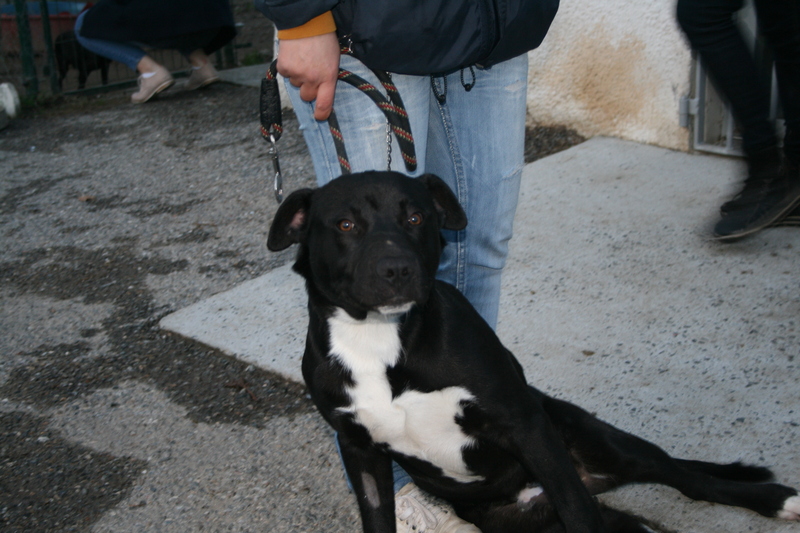 In Thursday’s blog we told you about the adoption of Selmi. Well today a dog who we are pretty sure is her brother was adopted. We could be wrong, but they are the same age, were found in the same area and have almost identical markings. We named him Selmo. You see how much trouble we have finding names? And remember we had a Selma a couple of months back, too! More inspiration required. In any case he is another great looking lad. Like his “sister”, one could at first glance assume him to be a banned breed, so the chances are that someone has an unsterilised dog out there having unwanted pups, which are inevitably turning up at the refuge. I do wish they would stop. In any case, lovely Selmo didn’t have too long to wait for his new home, as he left straight from the fourriere. Needless to say his space was taken almost immediately, as there have been a lot more arrivals than departures this week. We remain optimistic that better things are to come, and who knows, perhaps as early as tomorrow. Today was a rainy one in Carcassonne, so it is not surprising that in contrast to last Friday’s bumper day, we only had one adoption. For those of you who follow the ScPA and pay attention to such things, the name Perceval should flag up that this dog must have arrived while the person allocating names was going through a King Arthur phase. Which dates his arrival back to the end of August. 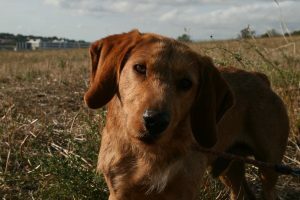 It also tells you that he arrived as yet another unidentified dog, as when dogs arrive with a name, we tend to keep it. With so much unfamiliarity around for recent arrivals, noise, stress etc, at least one thing remains constant. Who knows what Perceval was called before his arrival. Well, his owner, I suppose, as this dog definitely had a home before arriving as a stray. At an estimated five years of age, sociable and good on the lead, this was no long term stray. Hey ho. 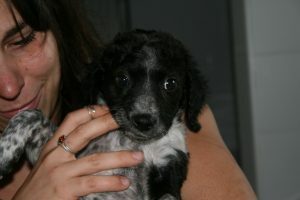 Perceval’s new family are great fans of this breed and have had many Breton spaniels in the past. All of them have learned to live with the family’s cats, and Perceval will have to take this on board, but the family are sure they can work this out. So tonight, rather than being in a kennel in the rain, Perceval is in a new home, and we are delighted for him. The forecast is good for tomorrow, so let’s hope for more adoptions. There was no blog yesterday although there was an adoption. To be honest I was hoping for another adoption today to make the blog a two-for one, but it was not to be, although we did have a reservation. So in any case, back to yesterday. Gorgeous Selmi arrived at the refuge in mid October as an unidentified stray. 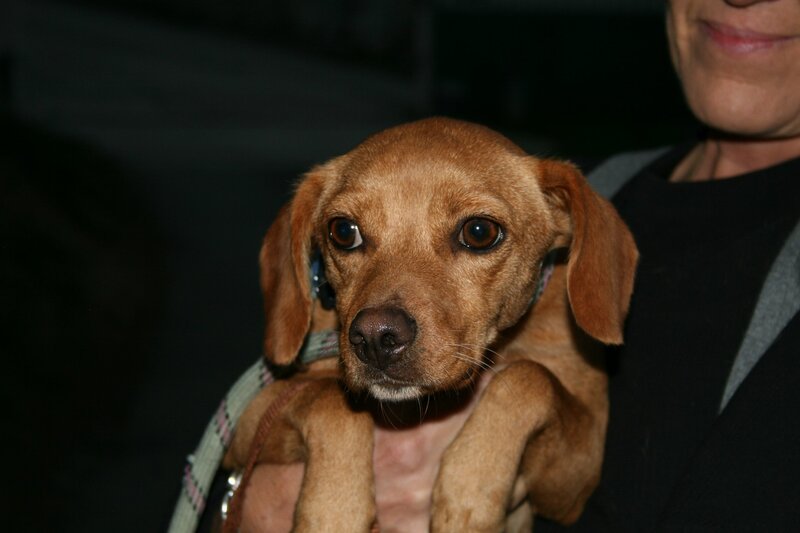 She was in good health and was extremely sociable, so it was clear that she had had a home before coming to the ScPA, but no one came to reclaim her. 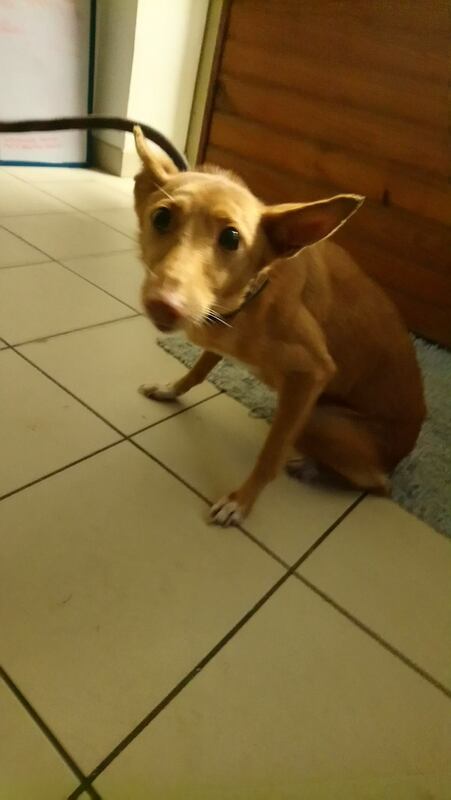 Luckily for her, despite initial appearances, she does not fall into the category of “dangerous dogs” (which, we must never forget, is based on a series on measurements, not on a dog’s character), so could be rehomed without any delay. Several families were interested in her. However it was very important that she was cat friendly. The test was carried out on Sunday and luckily for her prospective new owners, Selmi behaved pefectly. 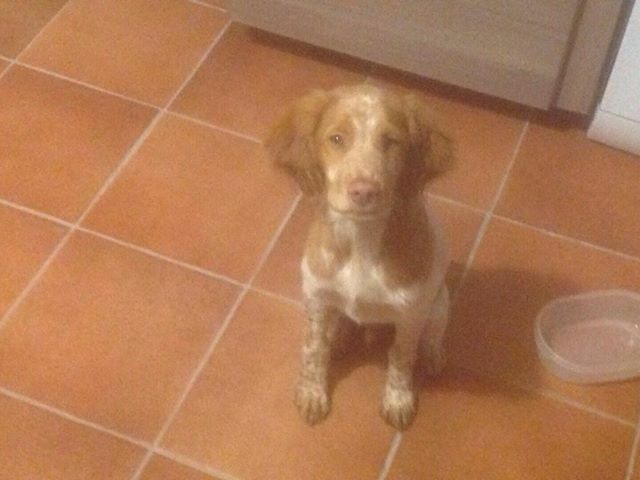 So on Wednesday she left the ScPA for her new life and we already have a photo of her looking very happy in her home. Many thanks to her new family. 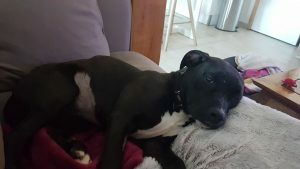 Selmi – ADOPTED and already relaxing in her new home. Today, as I say, there were no adoptions. However two dogs were brought in. They had supposedly been found just after the recent flash floods, and have been looked after for the past 6 weeks “without being reclaimed”. Had the dogs’ photos been put online anywhere, or the Mairie informed, we asked…Apparently not. It is a bit difficult to see how anyone could reclaim them, really. Please, if you find a dog do let people know. If possible take pictures, inform the local Mairie and the police and the local SPA or other refuge. It is possible that the dogs are not lost at all, and that this is just a pretext to abandon them, but imagine if this is not the case and that some poor owner is going out of their mind with worry ! “Maggie” and “Mae” have just arrived. Are they just lost? 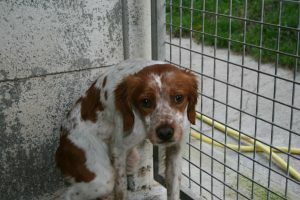 Today two more dogs left the refuge, both of them were small young females whom we could have rehomed several times over. So inevitably there will be some people who are disappointed, but we hope that they will not abandon their quest to find the perfect pooch. We firmly believe that there is a home for every dog, it is just that for some dogs there is more than one home. In any case, onto the news. First to leave was Brioche, who has now been renamed Naya. She is a pretty little cross breed; maybe some pinscher maybe some chihuahua, who was found and brought in just under two weeks ago. She was terrifed when she arrived and in fact made a bolt from the car of them gentleman who had found her, which resulted in a bit of a panic. But she was soon scooped up and brought to the refuge, where she settled in quickly. She turned out to be not as timid as we thought, and is a friendly and lievely girl whom we are sure will be very happy in her new home. Next to leave was puppy Opaline. She arrived a couple of days before Brioche and has been lucky enough to have spent her refuge time in the cat house. The dogs in there are actually separate from the cats, but are surrounded by feline odours. And this is maybe just as well, as Opaline’s new family are cat owners. Although the ScPA does of course have adult dogs who are fine with cats, all the adults that appealed to Opaline’s new family were not feline friendly (yes, we are talking about Pebble again, amongst others). So they offered a home to Opaline, and we are delighted for her. We have more good news tomorrow, so see you then! 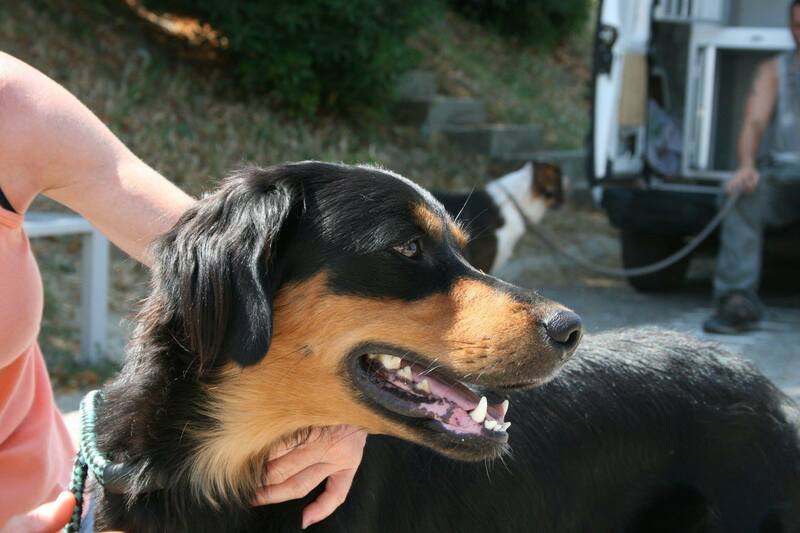 Two dogs who were brought to the ScPA for rehoming left for new lives today! 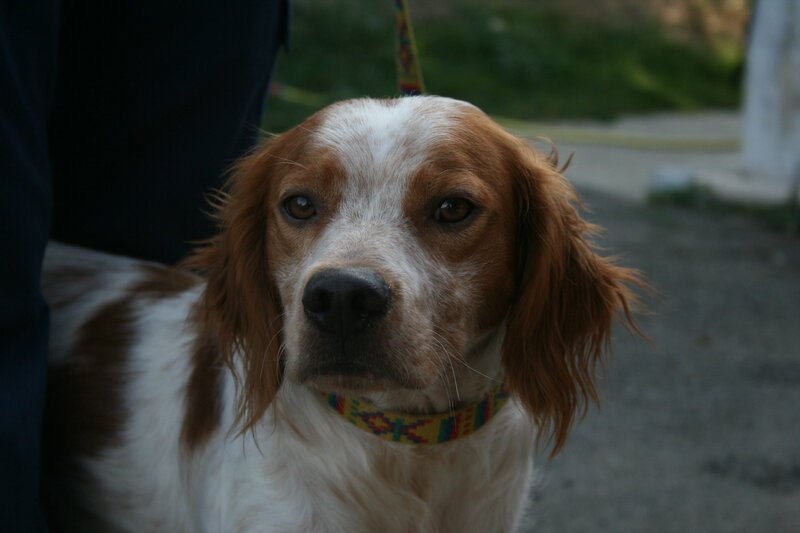 Google arrived at the ScPA at the end of May, meaning he has spent a whole six months at the refuge. That is less than many of our dogs, but a long time for a dog whom, thanks to his former owners, we know to be good with female dogs, cats as well as being house trained. Most of our dogs arrive as completely unknown quantities, so knowing anything at all is a bonus, of course, but with a CV like this we all expected Google to be adopted a bit quicker. Especially as he is a stunning border collie / setter cross who at four years old, is in the prime of life. We are pleased that he has found a new home, even if it did take six months for the right one to come along. Second was Cerise She arrived at the refuge at the end of July, and has made lots of progress since. Initially very nervous, she settled in nicely and has become a favourite on walks. A couple visited the refuge yesterday to find a new friend, and learning that their number one choice was not at all compatible with cats (naughty Pebble! ), they decided to come back today to meet some other candidates. Cerise ticked all the right boxes and off she went to her new life. So two dogs who were brought in for rehoming have left. As we have said before, it is sad for dogs to have to change homes, but being brought in responsibly by their owners is by far the best way for a dog to arrive. The more we know about a dog in a home environment, the more likely we are to find a home that will suit him or her. And further to yesterday’s excellent blog by Moira, it can avoid causing many people to spend hours of their time (we are all volunteers) playing catch up, as well as prevent a “foreign” dog being at risk. Let’s hope for more good news as a new week gets underway! At the beginning of October 3 joggers arrived at the SPA with the biggest dog we have ever seen. A magnificent 75kg Berger de Caucase, who we called Leo. Found as a stray we checked him over for a microchip. Our delight at finding one was short lived when we discovered that it was an unregistered Romanian chip! So, what was the problem with that? Well, France is a rabies free country and Romania is not so unless we could prove that Leo had been in France for a long time and he automatically had rabies free status or we could find his owner and papers then his future was at risk. At best 6 months quarantine and at worst euthanasia, Leos life really was on the line! First thing that was done was to check with all local vets to see if Leo was registered anywhere. He wasn’t. So where had this dog come from and how had he got here? We needed help, and fast! Its also heart warning when you appeal for help and other rescuers drop everything to help. We set up a great group of English, French and Romanian speaking rescuers whose detective skills were second to none! We went back to the details that we did have, an unregistered Romanian chip. We contacted the manufacturer of the chips and they were able to tell us what vet in Romania had bought that batch of chips. One of the Romanian rescue girls called the vet who was able to tell us who brought the pups in to be chipped ( the breeder) but not why Leo was chipped and it wasn’t registered on the system. It came as a big shock to learn that dogs can be legally removed from the Romanian system at the owners request. 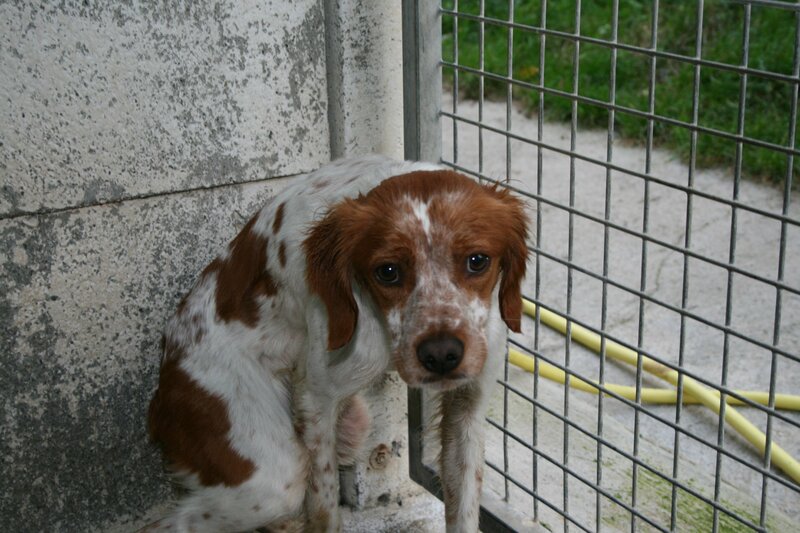 The only thing to do was to speak to the breeder who now lives in Italy to try and get information from him. This wasn’t easy, we did find him but him information was sketchy and unreliable. We spent a lot of time tracing and speaking to friends, contacts… all to no avail. The DSV, the UK equivalent to DEFRA were getting very tetchy and time was running out. We appealed again for information and received information from a very helpful lady who seemed to know the owner and kindly asked him to arrange for scans of Leos paperwork to be sent to us to save his dog life! From the passport scan we got a name, address and phone number of the person who bought him from the breeder. Back to the Romanian girls. The number wasn’t active, so, they called the equivalent of the local Mairie, who knew the family of the owner on the passport. She called them, and the mum told us her son had bought Leo for a friend , he was in Africa but she would ask him to contact us asap and low and behold he did! He had bought Leo and taken him to Corsica to his friend 3 years ago. This friend became Leos owner. We also got his name and contacts and heard that he was living in the Carcassonne area. 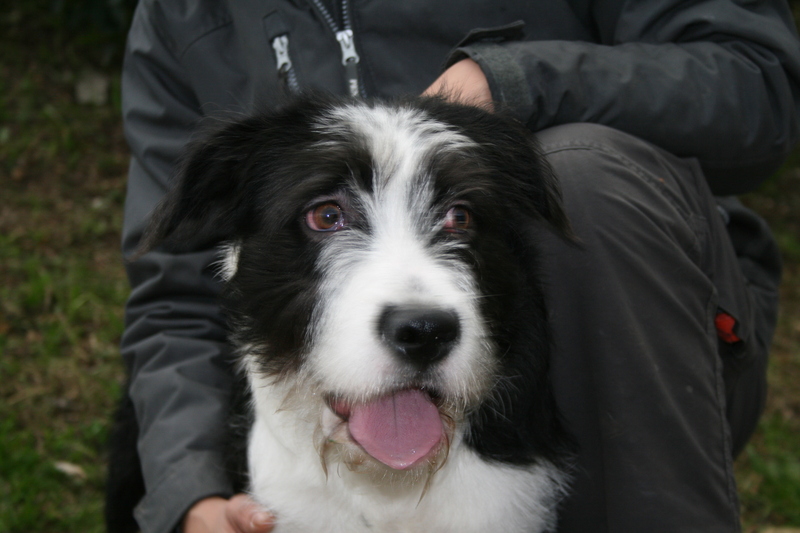 Wait a minute, 3 guys brought him in as they “found him whilst out jogging”….BINGO we had strong leads to the owner! A few calls later and we had tracked the owner down who was able to arrange for us to get all of Leos papers and sign a contract of abandonment, had he done this in the first place it would have saved many, many hours of rescuers time and ensured his dog was not at risk from euthanasia…. 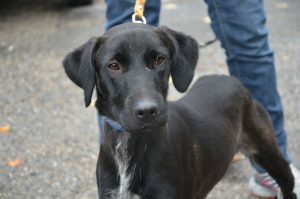 But, all’s well that ends well and now Leo is no longer at risk and is available for adoption. 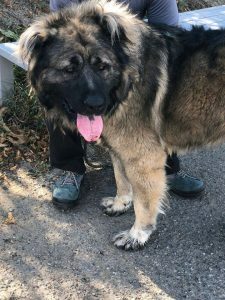 We need to spend some time really getting to know Leo but we have had various offers from breed associations as well as some individuals so it wont be long before he has a home. We have often had dogs brought in with foreign chips and we can usually track the owners, but Leo was the first from a non rabies free country. Rabies free status is not to be taken lightly even although the last reported dog with rabies in Romania was in 2016 and that the reality of Leo having rabies was minute. Our vet saw Leo regularly and he was always given a clean bill of health. We contacted a lot of associations who made attestations for our DSV that their dogs in similar situations were allowed quarantine as opposed to euthanasia. We did our homework! We even had an association who would have taken him for any quarantine period! If you do have a dog living in France from outside the EU please register them in France and make sure your documents are kept safe and their rabies up to date. So, if they get lost, they are never at risk. We are lucky as we have the resources and language skills to trace chips, some refuges don’t, and your dog could be euthanised after 10 days. Leo, whose real name is Mass.